July 2014 : Defense Fab - E-FAB, Inc.
Defense Fab : E-FAB, Inc.
What are E-FAB add-a-trace™ PCB jumpers? The E-FAB PCB add-a-trace™ jumpers are flat, stand-alone copper plated traces with sized pads and holes matching the circuit boards. Are ready for rigid-flex PC boards (pre-routed, flat and soldered jumper). Insulated and the pads are tinned, with solder ready. E-FAB add-a-trace™ jumpers are laid out exactly to the proper routing requirements using Gerber CAD file data or padmaster film to produce the exact size dimensions. 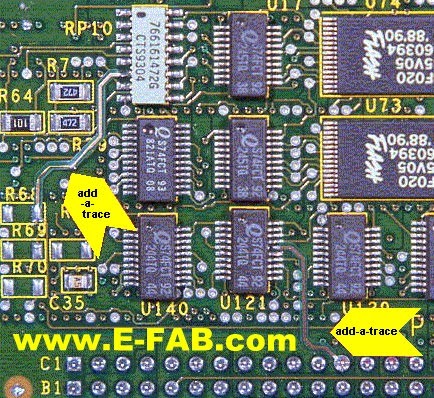 E-FAB add-a-trace™ jumpers are installed simply as a “PCB component” with very easy installation procedures. E-FAB add-a-trace™ jumpers are rigid flex PCB jumpers. E-FAB add-a-trace™ jumpers are a stand-alone item with copper plated traces and sized pads and holes matching your boards exactly. E-FAB add-a-trace™ jumpers are manufactured by E-FAB to exact required circuit details. Specify the dimensions of the E-FAB add-a-trace™ jumper and we can create it for you. If you need hundreds, thousands or millions of E-FAB add-a-trace™ jumpers pre-fabricated and pre-insulated to be added for circuit board ECOs (engineering change orders) E-FAB can customize the add-a-trace™ jumpers to your exact specifications. Request an E-FAB add-a-trace™ sales quote today. "Conflict Minerals" Policy on the source or origin of tantalum, tungsten, tin, and/or gold.